3.) Speech!! Tell about a time you had to speak or present in front of a group of people. During my school years, I was terrified of oral book reports. Absolutely terrified. Then, several years ago, I took a job as an interpreter at Bacon’s Castle, a historic property in our area. Slowly, my fear of speaking in front of (small) groups eased, just a little. Then, last year, I was asked to portray my grandmother in a twilight tour (also at Bacon’s Castle). Since my grandparents, along with their twelve children, one of whom was my mom, lived in the Castle during the 1920’s and 30’s, I was honored to pretend to be my grandmother for those two nights. Fortunately, I had a photograph of her, taken there at the house, by which to pattern my “costume”. What do you think? 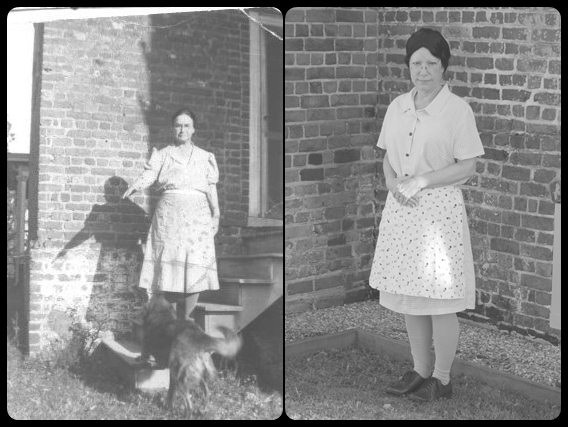 A thrift shop apron, a borrowed dress, a wig (and styling help from my friend, Bev), cotton stockings found on the internet, and I was transformed into a Depression-era housewife. We had a mini-rehearsal before the “crowds” arrived. I can honestly say that I don’t recall ever being so nervous in my life. But I made it. I’m not sure how many times I gave my “speech” over the course of those two nights. But each time seemed a little easier. I was stationed in the attic, and some of the local folks found it difficult to believe that I didn’t mind being up there alone between tour groups. Strange happenings have been reported at Bacon’s Castle for many, many years. 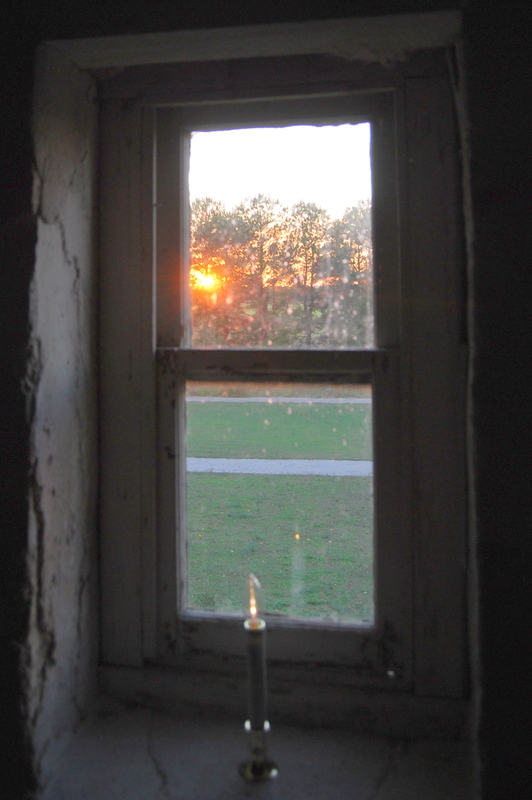 I did manage to catch the sunset through those 345 year-old windows. Overcoming the stage fright was difficult. But I’m glad I did. As a friend said, this was another memory to add to my Bacon’s Castle treasure box.